I had bought Mandakki puri or Kallepuri, from the Asian stores to make Bhel in that i was left with some of it, I was just thinking what shall i do with it, As i was going to soak for Dosas I thought let me use this also to make Dosas. Dosas come out soft and fluffy don’t spread it too much make it like a set dosa comes out very well. 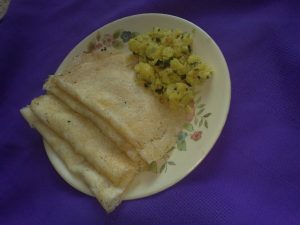 Then take the kallepuri put everything in the water wash it once or twice take it out from the water and soak it in curds for 1 or 2 hours just before grinding the Rice. Once everything is well soaked grind them all together into a nice smooth batter. Now the Dosa batter is ready actually you can use this batter immediately as the curds would have become sour and helps the batter in fermenting in no time. enri..estondu post publish maadiddera? Dosa looks good so does other posts, me happily drooling over them.